New Delhi: At age nine, Pune, Maharashtra-based Haris Imtiyaz Khan set a world record for being the youngest life portrait artist, completing the portrait in less than 30 minutes. 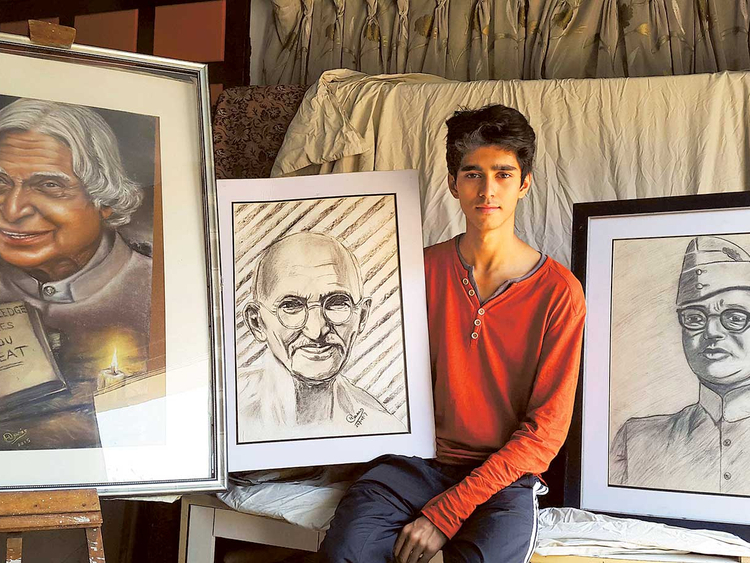 Self-taught, he has been drawing since the age of three, but it was only when he turned seven that his mother, Huma, and father, Imtiyaz Khan, realised his talent. In 2006, Haris began holding solo exhibitions and live shows at shopping malls in Pune and Mumbai and thereafter his artworks were auctioned. His brush with stardom happened in 2007 when, during his seventh exhibition at Walking Plaza in Pune, he performed a feat in front of a large gathering. Soon after, a shopping mall in Pune was adorned with drawings and paintings by Haris, which catapulted his career to a new level. Using many mediums including pencil and charcoal, water colours and oil paints, Haris has held more than 15 exhibitions, live shows and auctions — all the while receiving good grades in school. He has received accolades in India and abroad. Here are some excerpts from an interview. What project are you presently working on? I am working on an oil painting of London’s iconic clock tower and timeless monument Big Ben. I plan to keep it black and white, which will portray its relation with indeterminate time and even add to the painting that will be given a traditional feel. This is one of the recent commissioned works of art, and I hope to soon resume my original artworks that will epitomise inspirational messages for times to come. While making a portrait, what important elements do you take into account? Every individual has different features and personality. From straight hair to curly hair, to a stern jaw or a fleshy nose to a round or an oval face, everything stands out in a face. But I do not go searching for all these features that construct their personality. It is best to adapt to a sequence, and for me the paramount facet to begin with are the eyes. I have always stuck to it, as the eyes give away the entire basic structure to me. In art, what subjects interest you more? I have not only delved in, but have also studied both portraits and conceptual art. Portraits appeal to me and come to me naturally. Drawing these have shaped my destiny and that’s where I have gained recognition. But strangely, people have different notions about portraits and since they feel it is the most difficult medium to begin with, it should not be initiated at a young age. I feel proud to have turned this theory on its head. Apart from portraits, I also like conceptual art because it is not entirely a painting, but more of a message and a way to depict an issue without saying a word! Do you make a living off your art? How many works have you sold? I have never felt the need to actually make a living out of art, as my family is blessed with life’s comforts. Drawing and painting is both my passion and hobby, but yes, I must have sold over 20 of my works till now. My parents have also formed [the] Haris Art Foundation, a non-profit organisation for future charity activities for the underprivileged through my works of art. How has your work developed and what have you learnt over the years? To look at it from a visual perspective, there has been a vast improvement in many aspects. Not only are the finishing and detailing in my works much more elevated than before, I have also acquired a lot of knowledge by practicing and delving deeper into the field. There’s no end to learning and I am ever ready to explore new avenues. Are there any artists you admire and feel inspired by? I have always been an admirer of Leonardo di Vinci, the Italian painter, sculptor and architect. His works amazed me as a child and the use of different colours and shades in his masterpieces don’t cease to make me gape at them even now. As for inspirations, they keep changing with the time. But my first inspiration was my grandfather, who had amazing narrative skills and I must have heard maximum number of stories from him than anyone else in the family. Stories of his struggles, achievements and India’s freedom struggle have led me to make portraits of numerous Indian political leaders. Former President Dr Abdul Kalam also felicitated me after I made his portrait. I have come to understand that architecture is an integration of all subjects, especially mathematics and arts that excite my brain cells the most. It’s also a perfect blend of themes wherein one can explore ones artistic views and expressions. • Haris Imtiyaz Khan was acknowledged as Youngest Live Portrait Artist by World Record Academy — 2007. • Won the International Art & Craft Competition — 2007. • Won the Pride of Pune contest and awarded a trip to London — 2008. • Special performance during Commonwealth Youth Games in Pune — 2008. • American actress Sarah Jessica Parker named him among world’s eight greatest future artists — 2011. • Received the National Child Award for Exceptional Achievement by the Government of India — 2011. • Invited as speaker and performer at TED — 2012. • Winner of Pune Talent Hunt Competition — 2014.